For anyone who works in a city or town, one of the best parts of getting away is the chance to reacquaint oneself with things that are green. And even for those fortunate enough to live in a rural or semi-rural environment, the need for green (not the one with the dollar signs on it!) can run deep. 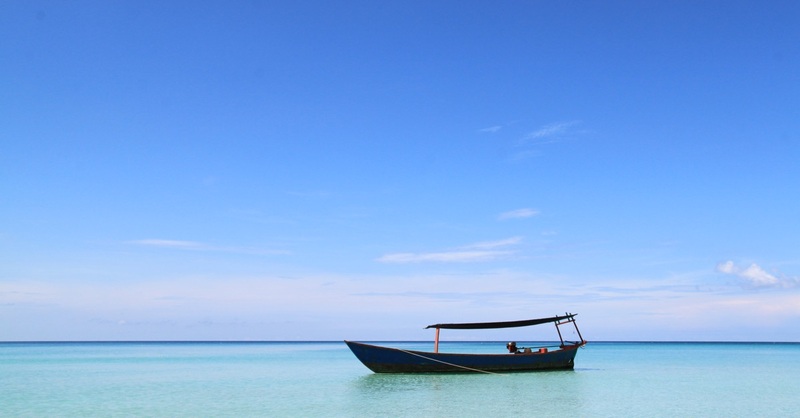 Fortunately, Siem Reap boasts a few hotels that have taken that idea to its absolute maximum and set around themselves lush tropical forests and gardens that would satisfy the needs of even the most chlorophyll starved. A couple of them, to the north of town, are described here. Take a magical mystery tour through the RiverGarden. The RiverGarden’s name is something of a clue. On the west riverside, to the north of town, this playful boutique hotel is set among dense, tall trees that evoke the magical mysteries of childhood. The comfortable rooms are set in chalets that are surrounded by forest and this is the first sight that greets guests as they step out of their doors in the mornings. The hotel’s small pool is also surrounded by a sort of garden playground, where you’ll find swings, hideaway beds, and if Angkor has completely exhausted you, a massage hut. Just up the road from the RiverGarden is the La Villa Loti Coconut House. The gardens here are not as extravagant as elsewhere, and they are nowhere near as large, but the beautifully designed rooms more than make up for that. They are however, very pretty, and offer a welcome and cool respite from the heat of Siem Reap. Thick palms hide the main house from view, while magnificent flowers and abundant greenery make this a charming, calming and peaceful environment. The restaurant comes highly recommended and at the prices offered ($46 to $75), the rooms and suites are definitely great value. On the other side of the river, but also to the north of town, are two hotels with the same owner, and to which the same principles have been applied to create two different effects. La Noria and Borann l’Auberge des Temples are both all about the gardens they’re in. Each hotel is made up of a number of chalets that house the guest rooms. Each room is simply but carefully decorated (to the joy of many, the owner does not believe in televisions), and each one has its own outdoor balcony or patio area: perfect for a relaxing cocktail or two, while listening to the birds sing and watching the butterflies flutter by busy doing their thing. Jungle fever at La Noria. 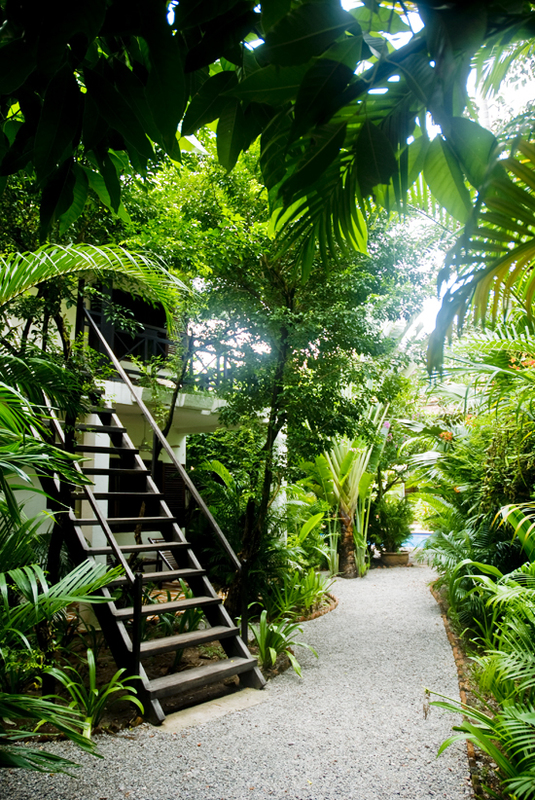 At La Noria, the rooms are accessed by a walk through thick tropical trees and plants: this is green, everywhere you look and it’s lovely. At $39 off season, and $59 on season, the rooms and the grounds here are smaller and cheaper than at Borann where prices start at $49. Borann is set up a dirt road, which could get interesting, i.e. very muddy, in the rainy season though this isn’t really a problem if you’re using tuk tuks to get about. 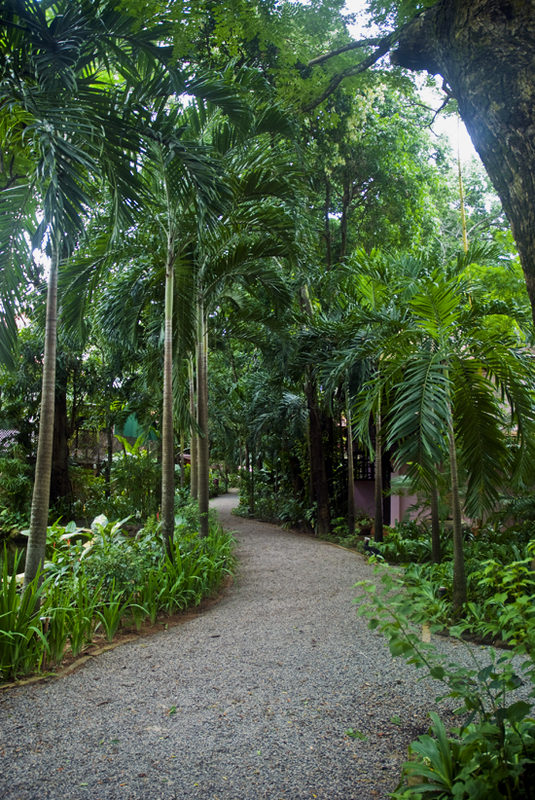 The gardens here are more widely set apart and somehow calmer, planted beautiful trees bejewelled with orchids mixed with ferns, tropical flowers and all kinds of trees. It’s quite the little paradise. As at La Noria, there’s a pool here too, and a large restaurant under a thatched roof from which to enjoy the breezes and soak up all that wonderful life-giving green.